Calculate your current cost per hire to plan your future recruiting spend. 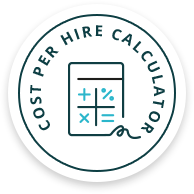 We’ve created this simple tool to help determine your recruiting costs and calculate cost per hire based on a well established formula. Step 1: Calculate your monthly, quarterly or annual cost per hire. In the cost calculations for step 2, remember to include only the costs that were incurred within this time frame. Step 2: These can include your recruiters’ salaries and benefits. For more help, see a full list of common internal recruiting costs. These can include your ATS, job board or candidate assessment fees. For more information, see the list of common external recruiting costs. Step 3: For example, if 50 people started working at your company within your chosen time frame, use this number for your cost per hire calculations. Analyze your recruiting process with Workable’s full set of recruiting reports. Available reports and analytics include: Candidate Source Reports, Pipeline Reports, Time to Hire and Productivity Reports. What exactly is cost per hire and why is it important? Cost per hire is the average amount of money spent on making a hire. It helps you estimate your future recruiting spend. For example, if your cost per hire is $3,000, and you plan on hiring 50 people next year, budget in $3,000x50 = $150,000 for your hiring activities. What are internal recruiting costs and how can you determine them? Internal recruiting costs reflect what you spend on internal resources for your hiring efforts. This may involve your recruiters’ salaries, their training expenses or office costs that support your hiring. Look for these costs in your payroll or general ledger. What are external recruiting costs and how can you determine them? External recruiting costs are fees paid outside your company. This may include spending on job boards, agencies, ATS, career fairs or other external sources that support your hiring. Collect these costs from receipts, invoices, vendor reports or your company’s general ledger. First, make sure all costs refer to the same time period. Then, decide what you’d like to do with your cost per hire. If you’d use it internally to track cost per hire over time, include all recruiting costs that make sense to your company. But if you’d need this metric to compare your costs to your industry average, try to include costs that are common across companies. For example, avoid consultancy fees or relocation expenses, but do include sourcing and job advertising costs. Which costs count for a particular time period? Sometimes, costs can be incurred within a time period, but the actual payment can be made at a later time. For example, an employee could be entitled to a referral bonus for a new hire, but they’ll receive that bonus if the new hire completes a three-month period on the job. It’s up to you whether to include these costs in your your cost per hire calculation for that time period. If you do, make sure to use this method in future calculations too, for consistency. Which hires are included in the cost per hire calculation? Decide who you consider a hire; is it those who’ve already started in their jobs or those who’ve accepted your job offer? Then, count all hires within the time period you set for your cost per hire calculations. To make comparisons between your company and others easier, count hires only when they’ve started their new jobs and only if they’ve been hired by a hiring manager. It’s better to exclude contractors, agency staff and employees who rotate jobs. How to integrate cost per hire analysis with other recruitment metrics? Cost per hire guides your recruiting budget but doesn’t tell the whole story on its own. The most important metric to compare with cost per hire over time is quality of hire. If your quality of hire is consistently high, don’t let costs scare you. There might be opportunities to reduce them, but always track the possible effects on quality. Note: We’ve taken information from the national standard for cost per hire by the Society of Human Resource Management (SHRM) and the American National Standards Institute (ANSI). This is a a list of typical recruiting costs to include in your cost per hire calculations. If you want to make internal comparisons over time, include any cost from the list. If you want to make comparisons with other organizations, don’t include the costs marked with an asterisk as they’re less common in cost per hire calculations across companies. Workable is all-one-one recruiting software. It streamlines recruiting with tools for job posting, candidate sourcing, applicant tracking, interview management and more. Track your progress with a suite of recruiting reports.